Home > Comet Clutches and Parts > Comet 216095A. Orange High Torsion spring for Comet 20 Series. > Comet 215698A Blue Spring. 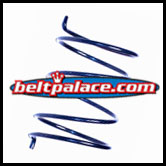 Comet 20 (21D) Series Driven Unit Tension spring (Blue) 215698A. Comet 215698A "Blue" Cam Spring. Genuine Comet Industries Part. Made in USA! 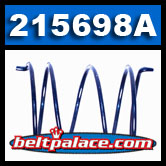 Comet 215272-A GOLD Compression spring for Comet 21/31 Series. Allows for bi-directional functionality (inboard or outboard facing). Comet 219459-A Driven Clutch. GENUINE COMET INDUSTRIES MODEL MODEL 21-D.
REPLACES TORQ-A-VERTER (TAV20) 20 Series 217772A, COMET 219459A-W1.